Is the Alaska TourSaver Coupon Book worth the purchase price? The answer depends on the kind of travelling you are doing, the places you are visiting, and the kinds of activities you are planning, but for us, we have definitely gotten our money’s worth out of the book – and we’re not done using it yet. How much does the TourSaver coupon book cost? The list price for the TourSaver book is $99.95, but don’t pay full price. We purchased ours in May before our trip and had a coupon code for $25 off which made our cost $74.95. The current offer as of June 26th on the TourSaver website at www.toursaver.com is $59.95, and I would expect that the price will continue to go down as the season progresses. How much have we saved? That is a total of more than $403 in savings by using the coupon book, or a net savings of more than $328 after allowing for the purchase price of the book. Are these activities that we’d really want to do anyway? Don’t worry about coupons being for companies you wouldn’t want to use or attractions you wouldn’t want to visit. TourSaver has enlisted the best outfits in each area; you’ll find them highly rated (and usually among the top things to do) on TripAdvisor and other sites. The TourSaver website has a complete list of the 2017 offers, with links to details and websites for each provider, so that you can see what’s available. Quite a few of the coupons are for cities on the Inside Passage, like Juneau and Ketchikan, that aren’t accessible by road and thus may not be visited by many RVers. But there are still plenty of worthwhile offers in other areas of the state. TourSaver also has an app that you can use on your smartphone to show the discount coupon. I think that the app would be much more convenient than carrying around the whole book, which you have to do because their terms specify you cannot tear out the coupons ahead of time. (Each book is numbered, and they understandably don’t want you sharing a book with someone else.) The app does not require internet access to redeem a coupon: once you’ve installed the app, it’s completely self-contained. The TourSaver app is an alternative to the coupon book, not an addition to it. You buy one or the other. If you have an iPhone and you’re traveling by RV, you’ll save money with the South/Central edition. Or if you’re on a cruise through the Inside Passage and won’t be visiting the Interior, you could get just the Inside Passage edition. If you have an Android phone, however, only the Statewide edition is available, so you might want to get the paper version instead to save some money. We just didn’t learn about the app until after we had made our purchase of the physical book. But if we were doing it again, we would definitely get the South/Central edition of the app instead for convenience. So is the TourSaver book worthwhile? In our opinion, definitely yes! 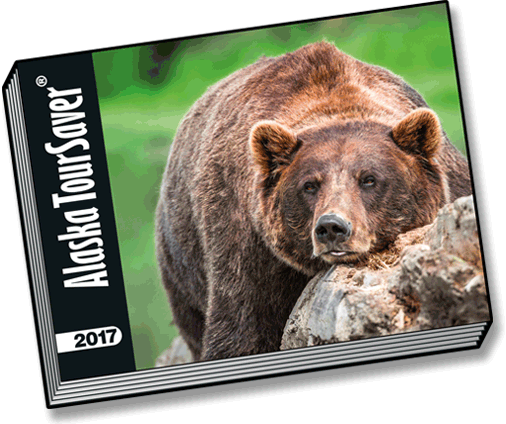 If you enjoy organized tours and plan to hit several of the cities in the TourSaver book, we recommend purchasing it for your Alaska trip. We’ve provided this information simply as a service to our readers and fellow travelers. We have not been compensated for it in any way. Really good information if Alaska ever becomes an RV bucket list item – it isn’t there yet! We’ve been fortunate to go to Alaska several times on land tours or cruises and loved it, so aren’t compelled to go by RV. Someday maybe when we get the lower 48 fully explored!